It is not that I like to play a lot with my Facebook profile or cover pictures, in fact, in 5 years I think I have just had 3 or 4 different profile pictures but lately I had some free time and I wanted to make something funny. Thus, after doing some research I found a really nice Gimp template in Jason Klein’s Blog which I used to create something I had in mind. But a couple of days later I realized that Facebook changed something and it no longer worked properly so I decided to adapt that template to the new format. With the template you can create pictures integrating both your cover and profile picture easily, here is the example I am using. I still have to add a text saying something like “Recursion KillS!. You can download the template with instructions included in the .xcf format here. (Remove the .jpg extension as WordPress does not allow me to upload the .xfc file. 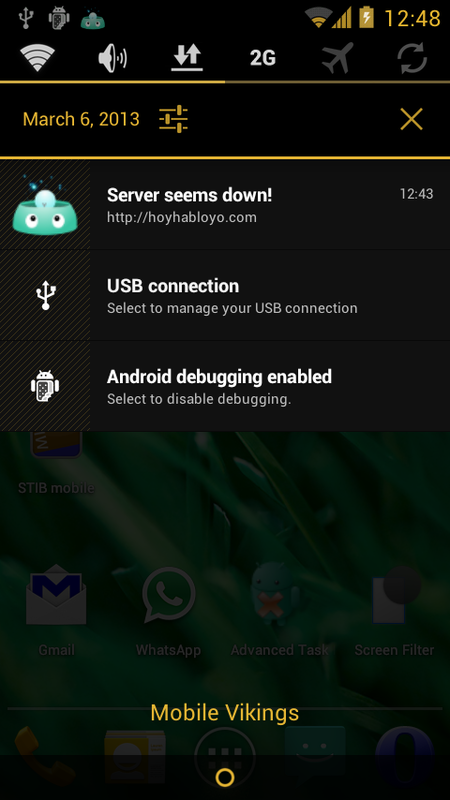 After a while without writing anything related to computer/scripting stuff I am back presenting a script for Android devices that will help you notifying when your personal server is down. I have a personal server running in a virtual machine that during some weeks was a bit buggy, as my personal webpage is hosted there and I needed it to be up 24/7 when system failed the host was no longer available but it took me some days to realize as I wasn’t checking it everyday. As I wanted to apply some Python knowledge under Android I came out with the idea: I have a phone that is always connected so let’s create a script that periodically (using already-available tools) check the status of the server and in case of problem notifies it, thus, I don ‘t have to worry about checking the availability of my server. Small script in Python that will run under SL4A. A tool (TaskBomb) that will run the script periodically. A server to be checked, http://hoyhabloyo.com in this case. First I installed TaskBomb (the scheduler), SL4A (scripting layer), the Python interpreter and SL4A Script Launcher which allows TaskBomb to run scripts as it can’t handle them directly. All these tools can be downloaded for free in the Android Market. And that is it! Now, every morning your phone will try to connect to the server, if everything is ok nothing will happen but if anything fails, it will display a small notification on the status bar (I established the rule on IPTABLES to make it fail). In SL4A page you can find examples and a book to start developing some powerful scripts. Enjoy! Good bye MLDonkey, hello Transmission! Ok, I’ve been a while without updating and althoguh I have some post almost written I wanted to share with you my last piece of code. more than 3 year sharing; 1.6 T shared!! Well, after this past years I’ve been using MLDonkey as my bittorrent client but as it doesn’t support magnet links I’ve decided to move on and give Tranmission a try. Installing it has been a piece of cake and as I was really glad with its web-ui I’ve decided to make it my default client and therefore, remake that script in order to work with this new client! # number of hosts currently active on the LAN. # Transmission and network vars. # echo "Hosts up $hosts_up  vs $hosts_up_before"
#echo "Setting limits $down_limit and $up_limit "
#Log that changes were done! I’ve also created a github repository that you might like to follow for further changes or to know a bit more about the script and settings. I’m developing a new personal web where I will probably include some links to this, my blog, I thought it would be a good idea to have an automatic way to extract them from this site. As I was a bit bored last Monday and wanted to remember my Python skills, I thought “Let’s do a really simple WP crawler to make that work for me!”. The next Python crawler it’s a really simple script. I know it could have been coded showing a beautiful menu with options and some methods having default params and all that, but just wanted to code it quickly. Every tricky part it’s commented but I will explain it in a few lines. It works!! As you can see, with just a hundred lines of Python where typed to achieve that, and much more could be done just modifying some parameters. Hope it helps! It’s been a long time since I don’t write neither in English nor about computer related stuff. It’s not that I stopped doing things but was a bit lazy about posting them here. Anyway, a few days ago I bout a new monitor tired of working in a 12” screen. I connected it and nothing happened, i mean, there was no signal output so, as usual, I prompted out a terminal and used that wonderful tool called xrandr. Perfect! I worked like a charm until I disconnected it and realized I have no output trough my laptop screen, dammit! and as my key-combination wasn’t working I had to restart it. 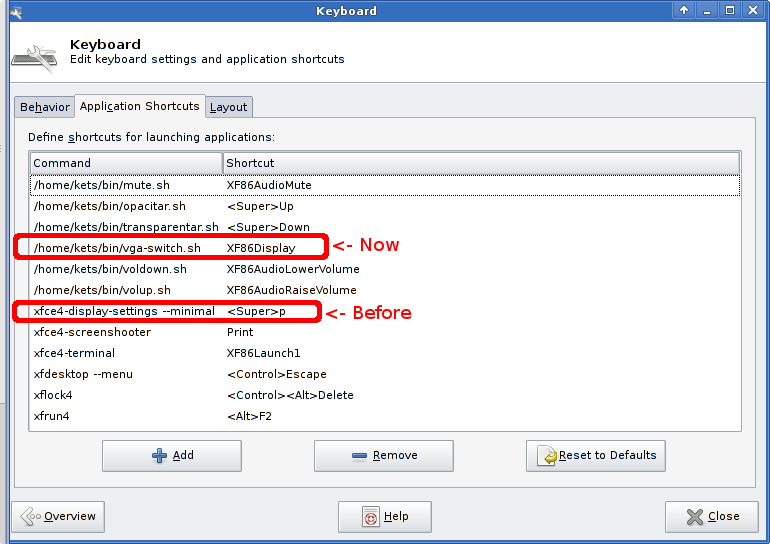 I found that xfce4-settins-manager -> keyboard -> application shortcuts were supposed to launch xfce4-display-settings –minimal which did nothing so, instead of that, based on a script I found in the web (see below) I coded a small script, gave it execution permissions and asigned it to my preferred shortcut (XF86Display – Fn+F7 in my Thinkpad X61s). # Lets check both LVDS and VGA state from the string "$display connected ("
#This should never be reached but just in case..
As you might already guessed, that script will only work as long as you are logged in a Desktop System (XFCE, Gnome, KDE…) and running the daemon listening to your shortcuts. But there’s no problem, you could also use it from a terminal if you assign it to your acpi event (see this) if you previously know which event is being launched on your combination (use acpid_listen).